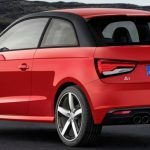 The new Audi A1 Sportback redefines the compact segment. Its striking, masculine design with genes of the sporty Ur-quattro characterizes the second generation of the successful compact car. The interior is accordingly driver-focused, with its emotive, customizable design.